In the ancient Indian mythology many great people had taken birth and one of them was "Lord Krishna" who was the sign of LOVE is also known for is Naughty "Shararti" behavior. He use to make her mother tired from is naughty behavior in childhood and her mother loved his behavior a lot.Lord Krishna was always hungry for White butter and he use to stole that from the housewives of his village with his friends and they all together eat that white butter. and this in detail is known as "Krishna Leela". 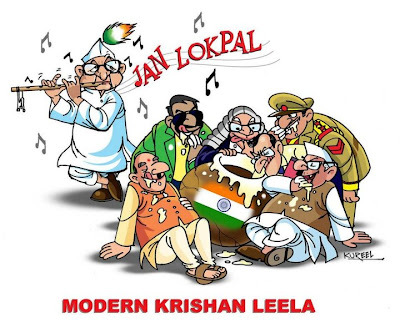 And with the time the "Krishna Leela" had also changed and now lets learn something about the modern "Krishna Leela". In modern Krishna leela the things are little opposite "Anna Hazare" is the Lord Krishna, The Pot hear is not filled with White butter it is our Mother India and corrupted Politicians, Leaders, Police etc are the one who are Eating our country. As I had already told you that the modern Krishna leela is little different hear the Anna hazare wants to protect mother India from the corrupted politicians , leaders etc. and wants "Jan lokpal" bill in India so a common man can also fight against corruption in India and the corrupted politicians,leaders etc are busy in Eating the country and they want to make this pot empty as fast as possible so they can fill their Stomach(hear means pocket).